Flamingos are a member of the bird order consisting of just one family, and they have more or less intense pink plumage and a highly specialized beak and tongue. The edge of the beak has a lamellar structure, which together with the tongue forms a filtering mechanism that allows the flamingos to filter plankton from the water. The pink colour of their plumage is caused by their food. The flamingo uses enzymes in its liver to convert components of the plankton, producing several pigments that are deposited in the skin and feathers of the adult birds. 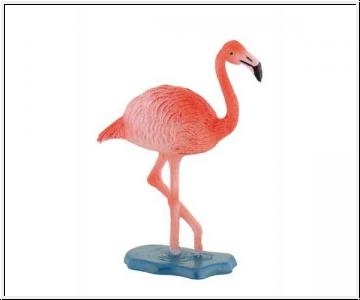 Flamingos stand around 90-155 cm tall.